Walking into Funkey Monkey is like entering a mysterious pirate’s cave, where you sense at any moment that you might hear the caw of a parrot or the call of an excited monkey. As you open the lid to the pirate’s treasure chest, what you discover is booty of the best kind: fun, flirty, and exotic goodies beautiful enough to satisfy the most stylish treasure hunter. Funkey Monkey’s owner, buyer, and inspiring force, Alicia Tugwell, is an unexpected dervish of energy and creativity. Self-proclaiming, “I don’t know what traditional would be,” this former advertising account executive led the corporate life, spending 10 years with FOX television in and nine years with CBS television in Dallas prior to moving her life and her teenaged son to Hilton Head Island five years ago. Tugwell’s mother and stepfather live on the island, and she knew this would be a place where her creative juices could flow and her son could finish his high school years in preparation for college. 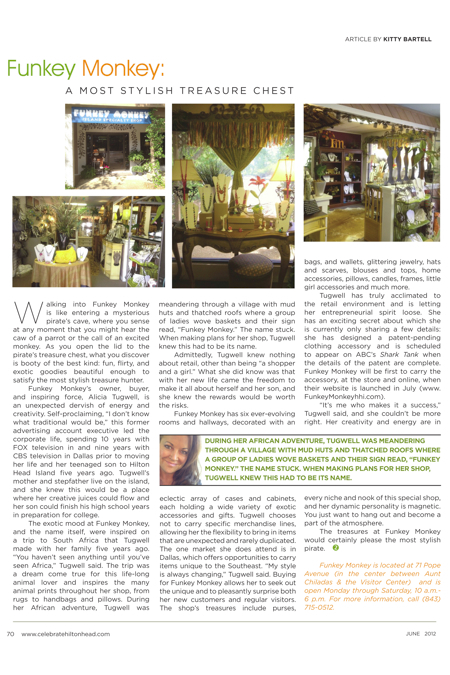 The exotic mood at Funkey Monkey, and the name itself, were inspired on a trip to South Africa that Tugwell made with her family five years ago. “You haven’t seen anything until you’ve seen Africa,” Tugwell said. The trip was a dream come true for this life-long animal lover and inspires the many animal prints throughout her shop, from rugs to handbags and pillows. During her African adventure, Tugwell was meandering through a village with mud huts and thatched roofs where a group of ladies wove baskets and their sign read, “Funkey Monkey.” The name stuck. When making plans for her shop, Tugwell knew this had to be its name. Admittedly, Tugwell knew nothing about retail, other than being “a shopper and a girl.” What she did know was that with her new life came the freedom to make it all about herself and her son, and she knew the rewards would be worth the risks. Funkey Monkey has six ever-evolving rooms and hallways, decorated with an eclectic array of cases and cabinets, each holding a wide variety of exotic accessories and gifts. Tugwell chooses not to carry specific merchandise lines, allowing her the flexibility to bring in items that are unexpected and rarely duplicated. The one market she does attend is in Dallas, which offers opportunities to carry items unique to the Southeast. “My style is always changing,” Tugwell said. Buying for Funkey Monkey allows her to seek out the unique and to pleasantly surprise both her new customers and regular visitors. The shop’s treasures include purses, bags, and wallets, glittering jewelry, hats and scarves, blouses and tops, home accessories, pillows, candles, frames, little girl accessories and much more. Tugwell has truly acclimated to the retail environment and is letting her entrepreneurial spirit loose. She has an exciting secret about which she is currently only sharing a few details: she has designed a patent-pending clothing accessory and is scheduled to appear on ABC’s Shark Tank when the details of the patent are complete. Funkey Monkey will be first to carry the accessory, at the store and online, when their website is launched in July (www.FunkeyMonkeyhhi.com). “It’s me who makes it a success,” Tugwell said, and she couldn’t be more right. Her creativity and energy are in every niche and nook of this special shop, and her dynamic personality is magnetic. You just want to hang out and become a part of the atmosphere. The treasures at Funkey Monkey would certainly please the most stylish pirate. 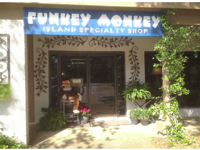 Funkey Monkey is located at 71 Pope Avenue (in the center between Aunt Chiladas & the Visitor Center) and is open Monday through Saturday, 10 a.m.-6 p.m. For more information, call (843) 715-0512.